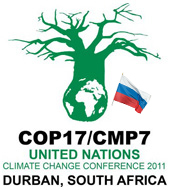 December, 8: Russian delegation to COP17 held a press conference this morning. A.Frolov, head of Roshydromet, said human impact on climate change is indisputable (while it has been debated a lot by Russian scientific community). He said that Russia reduced its emissions by 36% since 1990. NGOx consider this is a questionable achievement since it is mostly due to the industrial crisis of the 90-s. Mr. Frolov also stated that Kyoto-2 is a false goal and Russia will not be a part of it. After the question about the participation in the second commitment period of KP a very diplomatically correct and vague answer followed, by Alexander Frolov, head of the delegation and head of Roshydromet. According to him, Russia as an Annex 1 country has fulfilled all the obligations, Russia’s emissions went down by 36% comparing to 1990 level which provided for the 50% of global emissions reduction and made Russia a global environmental donor. Now Russia is awaiting the announcement of the first commitment period, according to the existing rules and procedures. Russia supports the creation of a new global legally binding agreement uniting all developed and developing countries. The prolongation of the Kyoto protocol is a false goal which leads us away from the main issue of global emissions reduction, since those who are ready to support Kyoto-2 are not world’s largest emitters. Entire European Union, for instance, only accounts for about 11% of global emissions. Oleg Shamanov added, that the main problem of Kyoto-2 is that it will only cover 17% of global emissions (now it covers only about 30%). His opinion is that KP2 does not contribute at all at the level required to serving the main goal of fighting climate change and is neither environmentally, not economically, nor politically appropriate. Nevertheless, Russia is ready to take upon itself commitments withing the UNFCCC framework and supports the implementation of Copenhagen and Cancun agreements. As for the outcomes of COP17, Russia is anticipating the creation of a roadmap towards a new legally binding global agreement. Russia also is in favor of boreal forests being included in REDD mechanism. Answering a question about the scientific consensus on the acknowledgement of human impact on climate change, the head of the delegation made a clear statement that human activities play a crucial and desicive role in this issue and that the consequences of climate change may be of a catastrophic scale for Russia. We see it as a highly positive fact, since until recently a lot of scientific discussion has been going on on whether current climate changes are man-made. Nothing was said on Russia’s position on the gap between the end of the first commitment period of Kyoto and a remote date of the adoption of a new agreement. According to Oleg Shamanov, the fact that we are part of KP and that we have adopted emissions reduction goals by 2020 by 25%, which was stated in Copenhagen, is enough. RSEU Climate Secretariat may not regard this as an adequate answer since even 25% signifies an actual emissions growth by 2020. Furthermore, in an amendment to the Copenhagen Accord the numbers pledged by Russia are 15 to 20% which gives an even broader space for emissions growth. The lack of a consistent position of Russia on the climate regime between Kyoto-1 and a new agreement (it may by many years from 2013 up to undefined date) has a negative impact both to the international negotiations process and to the national climate and energy policy.